I recently attended the launch of Aquafina in Ibiza Beach Club, Bonifacio Global City, and as someone who doesn’t go out or party at all, this was very new to me—more so that it was the launch of a bottled water brand, which I initially assumed was a skincare brand or product until I read the full event invite! Before entering the venue, I was asked to answer the question: What was I best at? And it really stumped me, because though I’m confident enough to say that I’m in good in things like sports, makeup, and writing, I don’t really know where I’m actually the best at. Is it outrunning and out-reading people on the field whenever I play Ultimate? Is it the way I do my own makeup? Is it my ability to write a full article in less than 30 minutes, especially when it’s crunch time? Or maybe it’s the way I fan girl over WWE and Harry Potter that just might be unparalleled? I don’t really know! But anyway, going back to Aquafina, it’s actually a bottled water brand trusted by many consumers around the world since it was introduced in the United States more than 20 years ago. Their water is purified using the best technology available, and this process includes reverse osmosis, ozonation, and carbon filtration to remove chlorides, salts, and other substances that can affect the taste and quality of water. 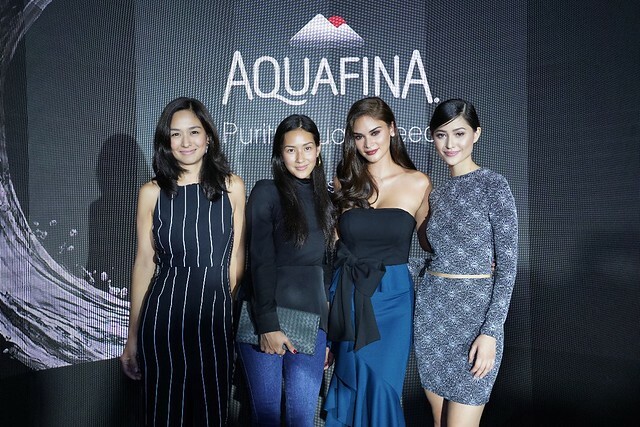 As the world’s best-selling bottled water brand, Aquafina aims to bring out the best in every Filipino, and to represent this advocacy, they chose none other than Miss Universe 2015, Pia Wurtzbach, to be the very first brand ambassador of Aquafina in the Philippines. It’s only apt to choose someone with an inspiring backstory, a stellar career, and who inevitably embodies what it means to work hard, stand out, and become the best! Joining Pia on stage during the launch were Calyxta cover girls, Maureen Wroblewitz (October 2017) and Kelly Misa (May 2017), and Mikaela Martinez. Aquafina will soon be available in all leading supermarkets and grocery stores at Php 10 for 350mL, Php 15 for 500mL and Php 24 for 1L. Visit their Facebook page to learn more about how you too can become the #BestAt anything you please!